The National Prescription Drug Take Back Day Is This Saturday, Oct. 27th of 2018! 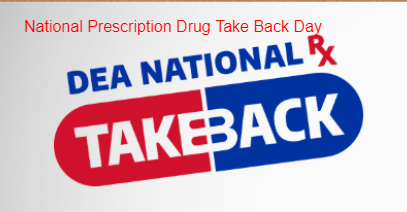 This Saturday, Oct. 27th of 2018, the DEA has organized a National Prescription Drug Take Back Day throughout the entire Country. This is one way of helping to deal with the opioid crisis that has been declared a national crisis recently. MedWaste Management will provide continued coverage of take back event as well as other efforts being made to help with our opioid crisis. The DEA and Google both provide locators to find your nearest prescription drug take back locations. Check out The DEA and Google pages below. They contain tools and more info on the ever growing efforts to help people properly dispose of their unused prescription drugs. This is certainly part of the bigger plan to help end the opioid crisis. As President Trump signed legislation providing resources to help end our opioid crisis, representatives of companies pledging to help stood behind. You can watch footage of the President with others discussing our opioid crisis and about the things that our Country is doing to stop it, including prescription drug take back events, and more responsible doctor prescribing. Drug Take Back And Sharps Collection Day In Napa County – Saturday, October 27, 2018, from 10am to 2pm, at numerous Napa County locations. The Police Departments and Sherriff’s offices in Napa County, along with Kaiser Permanente and the Drug Enforcement Administration (DEA), will host unused medication and sharps (used syringes and needles) collection events on Saturday, October 27, 2018, from 10am – 2pm, at numerous locations around Napa County. Residents in the area are encouraged to bring their unused or expired over-the-counter and prescription medications to one of six collection locations throughout Napa County. It is recommended that any personal information on medication containers be removed or blacked out before dropping off. Additionally, these one-day collection sites can legally accept federally-designated “controlled” substances that include many highly addictive prescription medications such as morphine and OxyContin, as well as illegal narcotics such as LSD and ecstasy. These collection sites accept sharps and unused or expired over-the-counter and prescription medications, and “controlled” substances that include many highly addictive legal and illegal drugs. In addition to the environmental impact of improperly disposed medications, prescription and over-the-counter drugs that languish in home cabinets are highly susceptible to misuse and abuse. Rates of prescription drug abuse in the U.S. are alarmingly high, as are the number of accidental poisonings and overdoses due to these drugs. Studies show that the majority of abused prescription drugs are obtained from family and friends, including from the home medicine cabinet. This service is free and anonymous. Can’t make the collection event on October 27th? Those unable to take items to the event can dispose of unwanted pharmaceuticals (uncontrolled substances only) and home generated sharps year-round at the Napa-Vallejo Household Hazardous Waste Collection Facility located at 889A Devlin Road, next to the Transfer Station in American Canyon. The facility is open every Friday and Saturday from 9am to 4pm. For “uncontrolled” substances and sharps, there are several local year-round opportunities for safe and legal disposal, which can be found online at www.naparecycling.com/medicine. Mail back services are available for your home generated sharps. Additional year-round options for residential medical sharps can be found online at www.naparecycling.com/medical-sharps-disposal or call the Napa County Department of Public Works for more sharps disposal information at 707-253-4094. The City of Beverly Hills is hosting its annual Household Hazardous Waste and E-Waste Roundup!! Saturday, September 15, 2018, from 9:00 a.m. to 3:00 p.m.
West Third Street, between Foothill Road and Civic Center Drive. Household Hazardous Waste cannot be discarded in your regular trash can. Included in this category are any items with potential for reactivity, ignitability, corrosivity, toxicity, or persistence. Examples include unfinished bottles of drain cleaner, paint, opened receptacles of motor oil, antifreeze, and fuel, vermin poisons, other poisons, pesticides, herbicides, fluorescent lamps and lamp ballasts, smoke detectors, batteries, home-generated sharps waste, some types of cleaning chemicals, some expired or unused medicines, illegal substances, and consumer electronics (such as televisions, computers, and cell phones). There are disposal points open throughout the year. All L.A. County Residents are invited to drive over to West Third Street, between Foothill Road and Civic Center Drive, and drop off household hazardous waste and E-waste. Place items safely in a box and haul them over! There’s a limit of 15 gallons, or 125 lbs of hazardous waste per trip. To properly and safely dispose of hazardous waste, call the Los Angeles County Hazardous Waste Roundup Hotline: (800) 552-5218 or City of Los Angeles (800) 98-TOXIC or attend a county sponsored round-up. Please refer to the Household Hazardous Waste Roundup calendar for a roundup near you! The environment is full of toxins. Petrochemicals, Carcinogens, Halogens, Xenoestrogens– there are so many names and categories for so many chemicals that are out there, waiting to make us ill. They are in the air we breathe, the water we drink, the foods we consume, and the products we use. In 2006, the Centers for Disease Control reported that the average American has 116 our of 148 synthetic compounds in his or her body, including dioxins, polycyclic hydrocarbons, and organochloride pesticides. The average umbilical cord contains 217 neurotoxins, 208 of which are known to cause birth defects. There are about 80,000 chemicals in commercial use in the United States, and only about 2% of those have been assessed for their safety. The Environmental Working Group, a U.S. environmental health research and advocacy organization, keeps an updated list of the worst offenders. We encounter many of them daily. Or, they can do all three. The human body has defenses to guard against all sorts of harmful exposures. For example, damage to DNA cells can lead to cancer, but often, DNA damage can be repaired. But the thing about cancer is, it starts years before the actual diagnosis. Let’s say somebody’s body is less able to deal with incoming toxins and the DNA doesn’t get repaired. It’s the unrepaired DNA damage that can lead to mutations in genes or the cellular structure. Mutations in certain genes or cellular structure can cause cancer. You can also inherit mutations when your parents have been exposed to toxins. The time between the first, slight cell damage and actual cancer has a long latency period, which makes it hard to tell which exposure to which toxin led to the mutation. Remember that there are 80,000 different chemicals we people are exposed to over our lifetime. This is why it is hard to determine whether a specific chemical causes cancer. Having said that, the Cancer Panel Report and the ATSDR single out Asbestos, Arsenic, Beryllium, Vinyl Chloride, Radon, formaldehyde, and benzene as known human carcinogens. Asbestos was adapted and widely used in building materials for its fire and chemical proof properties. It also has soundproofing and insulating qualities. Asbestos has been used in thousands of products which are still found in millions of homes today. Asbestos is a risk when its fibers become airborne after it’s been disturbed in some way. If inhaled, these fibers can lodge themselves in the lungs, causing scarring and abnormal cell growth, leading to a number of cancers, including mesothelioma. Common asbestos-containing products that can be found in the home include: Insulation materials for pipes and furnaces, attic insulation, shingles, siding and roofing tiles, soundproofing, plaster and joint compounds, casings for electrical wires, some floor tiles and flooring adhesives, and some plastics and paints/adhesives. Researchers began to find links between asbestos and Cancer already in the 1950’s, but a lot of the products are built into homes and haven’t been removed. Asbestos is not a problem if left undisturbed. It’s only harmful when it’s airborne. If you suspect a product or home contains asbestos, it is important that you don’t touch or disturb it in any way. It is especially critical to take care if you are planning to remodel or if you find any damaged building materials in your home. Check with your children’s school. Many schools use older buildings. According to law, every school in the US is required to have a detailed asbestos management plan, in accordance with The Asbestos Hazard Emergency Response Act (AHERA). Schools should inspect their building for asbestos, and re-inspect it at least every three years. They need to provide training in asbestos awareness to custodial staff, and if asbestos is found on premised, write up a detailed plan on how they will get rid of it using people who are trained and certified to handle asbestos properly. Arsenic is toxic, bio-accumulative and carcinogenic. It is a metalloid element that occurs in nature, in both organic and inorganic compounds. Organic arsenic is “natural” and therefore less toxic than the inorganic arsenic. Arsenic was used as a straight-out poison in the olden days. At a concentrated dosage, it is lethal. Lesser dosage and exposure to arsenic via water and foods can lead to (a) Various kinds of cancer (lung, bladder, liver and kidney), (b) reproductive and developmental issues; (c) cardiovascular disease; (d) reduced intellectual function in children and (e) possibility of diabetes and high blood pressure. There are two inorganic arsenic species that are found predominantly in groundwater. Arsenic poisoning via groundwater has become a worldwide problem. See Bangladesh. The worst toxic exposure issues are usually traced back to the groundwater. When contaminated groundwater is, or even was, used for irrigation, people can be exposed to arsenic via foods that were grown in soil that was saturated with arsenic-laced groundwater. It’s all in the water, folks… and then it’s in the soil. And then, it’s in the foods. The elevated level of arsenic in soil has resulted in elevated concentrations of arsenic in food crops, such as rice and some vegetables. There are different levels of arsenic in the vegetables’ roots, stems, or grain parts. Just like in humans, arsenic bio-accumulates in crops, so the arsenic level depends on the duration and level of exposure. Then, if cows or other cattle eat the arsenic-laced crops— guess where the arsenic ends up. Another way the arsenic reaches us humans. Arsenic exposure can occur via water, soil, crops (vegetables and grains), milk, and meat. On top of that, According to the FDA, poultry farmers are allowed to feed arsenic to birds, for “growth promotion, feed efficiency, and improved pigmentation.” The arsenic affects the blood vessels in chickens and turkeys, causing them to appear pinker and therefore fresher. “When the Minnesota-based advocacy group Institute for Agriculture and Trade Policy tested conventional poultry, it found the poison (arsenic) in 55 percent of chicken parts tested, with the highest amount–21.2 parts per million–occurring in generic brands. If you want to know how safe that is, the EPA considers 10 parts per billion in drinking water to be high enough to pose a cancer risk. The chickens tested had up to2,000 times more of these cancer causing arsenic levels! The European Union has outlawed the use of arsenic since 1999. Scientists at Consumer Reports recommend restricting rice and rice-based hot cereal, ready-to-eat cereal, rice pasta, and rice cakes to two to three servings a week for adults, and one to one-and-a half servings a week for children. Thoroughly rinsing and cooking your rice with six cups of water to one cup of rice and then draining the excess water can reduce inorganic arsenic content by about 30 percent. Additionally, purchasing foreign rice can be a safeguard. Choose organic poultry. In order to use the label of USDA-certified organic chicken, it is legally prohibited to use arsenic in the feed. (The poultry must also be free of pesticide, chemical fertilizers, hormones, and antibiotics, among other requirements. Beryllium is used industrially in three forms: as a pure metal, as beryllium oxide, and most commonly, as an alloy with copper, aluminum, magnesium, or nickel. Beryllium oxide (called beryllia) is known for its high heat capacity and is an important component of certain sensitive electronic equipment. Workers in industries where beryllium is present may be exposed to beryllium by inhaling or contacting beryllium in the air or on surfaces. Inhaling or contacting beryllium can cause an immune response that puts you at risk for developing a debilitating disease of the lungs called chronic beryllium disease (CBD). Beryllium-exposed workers may also develop other adverse health effects such as acute beryllium disease and lung cancer. Most of the vinyl chloride produced in the United States is used to make a polymer called polyvinyl chloride (PVC), which consists of long repeating units of vinyl chloride. PVC is used to make a variety of plastic products including pipes, wire and cable coatings, and packaging materials. Other uses include furniture and automobile upholstery, wall coverings, housewares, and automotive parts. At one time, vinyl chloride was used as a coolant, as a propellant in spray cans, and in some cosmetics. The U.S. Department of Health and Human Services has determined that vinyl chloride is a known carcinogen. The International Agency for Research on Cancer has determined that vinyl chloride is carcinogenic to people, and EPA has determined that vinyl chloride is a human carcinogen. Use of Vinyl Chloride has been highly restricted so it’s not very likely to be a major concern today. Inhalation causes a large variety initial symptoms way before there is damage to internal organs or cells. You’d notice if you’ve been exposed to Vinyl Chloride. Vinyl Chloride also has an easily detectable smell. There is Vinyl Chloride in cigarette smoke. PVC products tend to have phthalates in them too, which are endocrine disruptors. It would be smart to avoid phthalates as well. Phthalates are chemicals used to soften plastics. They are found in a wide variety of products, including shampoo, cosmetics, lotions, bottles, nail polish, and deodorant. At one time most flexible plastics contained high levels of phthalates. Fortunately, they are being phased out in the US and Europe due to emerging recognition of their risks. exposure to phthalates is associated with adverse genital development and can significantly reduce masculine behavior in boys. This is true for all endocrine disruptors, but phthalates are documented. Women with high exposure to phthalates while pregnant report significantly more disruptive behavior in their children, while other research by NIEHS has found phthalate exposure can lead to thyroid dysfunction in adults. 53-56% within three days of stopping exposure. Minimize use of plastics with the recycling code #3. Use PVC-free containers. Buy plastic wrap and bags made from polyethylene and use glass containers. If you do use plastic containers, do not heat or microwave them. Choose phthalate-free toys. Many large toymakers have pledged to stop using phthalates, but be sure to look for toys made from polypropylene or polyethylene. Purchase phthalate-free beauty products. Avoid nail polish, perfumes, colognes, and other scented products that list phthalates as an ingredient. Many scented products simply list “fragrance” as an ingredient, which often incorporates a number of different chemicals including phthalates. Try to minimize these products, or for more information on phthalate-free cosmetics and personal care products, visit the National Campaign for Safe Cosmetics and the Environmental Working Group, which maintains a database on cosmetic products and their ingredients. Radon is a colorless, odorless, radioactive gas. It comes from the natural decay of uranium or thorium found in nearly all soils and it typically moves up through the ground and into the home through cracks in floors, walls, and foundations. It can also be released from building materials or from well water. Radon breaks down quickly, giving off radioactive particles. Long-term exposure to these particles can lead to lung cancer. The U.S. Environmental Protection Agency estimates that radon causes about 21,000 lung cancer deaths in the United States each year. 1 in 20 homes in the United States have elevated levels of radon present. Radon exposure is the second leading cause of lung cancer after smoking and the leading cause among non-smokers. Radon Mitigation is the process of decreasing radon in homes found to have elevated levels present. Get your home air checked. It is simple and inexpensive. If you use a well, check your water. Formaldehydeis a known human carcinogen. It is a colourless, flammable, strong-smelling chemical that is used in building materials and in the manufacture of many household products. It also occurs naturally in the environment and is produced in small amounts by most living organisms as part of normal metabolic processes. Formaldehyde sources in the home include pressed-wood products such as particleboard and plywood, glues and adhesives, permanent press fabrics, cigarette smoke, and fuel-burning appliances. In addition, formaldehyde is commonly used as an industrial fungicide, germicide, and disinfectant, and as a preservative in mortuaries and medical laboratories. Research studies of workers exposed to formaldehyde have suggested an association between formaldehyde exposure and several cancers, including nasopharyngeal cancer and leukemia. Use “exterior-grade” pressed-wood products to limit formaldehyde exposure in the home. Ensure adequate ventilation and moderate temperatures. Reduce humidity levels with air conditioners and dehumidifiers. Go natural and grow plants in your home. Benzene is a colourless liquid that evaporates quickly. It is naturally found in crude oil and is a basic petrochemical (Petrochemicals are endocrine disruptors.) It is also a known human carcinogen. Substantial amounts of data link benzene to aplastic anemia, bone marrow abnormalities, and leukemia — particularly acute myeloid leukemia (AML) and acute non-lymphocytic leukemia (ANLL). Benzene is found in tobacco smoke, gasoline (think car exhaust), pesticides, synthetic fibers, plastics, inks, oils, and detergents. It has been in soft drinks, although they have since reformulated to exclude it. About 50% of the benzene exposure in the US results from smoking tobacco or from second-hand smoke. Don’t smoke and try to avoid second hand smoke. Ensure adequate ventilation in your home. Keep plants in the home. Poison is in the dose. Environmental toxins cause serious health concerns when there is an accumulated exposure. The more prolonged or excessive the exposure is, the worse the effect. Ironically, prolonged, acute stress can also disrupt endocrine function, cause organ failure, hinder development and is implicated in cancer! So don’t stress out about all these toxins in your environment. Using a plastic cup every once in a while is not going to kill you. It’s impossible to completely avoid exposure to known human carcinogens. However, a few simple steps can go a long way towards protecting you and your loved ones. *Don’t expose yourself to secondhand smoke. *Get your home air and water checked for radon. *Use a water filter. An air filter is great too. *Check your home for asbestos materials. *Use less products with “fragrance” as a listed ingredient. *Keep plenty of plants in your home. *Decrease use of plastic. Transition to glass, stainless steel, and porcelain containers, mugs and glasses. *Eat more organic poultry and produce. Wash all produce. If possible, purchase only organic options from the Dirty Dozen. *Transition to less processed foods and products. The less processed, the better. There’s no need to freak out over occasional exposure to environmental toxins. Just look for simple ways to reduce your everyday exposure. Make changes slowly, one at a time, in a manageable way, and you will decrease your risk with minimal stress to yourself and others. How do I dispose of home generated medical waste? Click here for a list of FREE approved locations to drop off home medical waste at, in California. How do I dispose of home-generated medical waste? Package It: Make sure to package your home sharps waste and needles in approved travel sized or medium sized or large sharps containers. This will allow the waste to be safely handled and transported for disposal . If you don’t yet have a sharps container, try packaging your sharps waste in a heavy duty plastic container, such as a laundry detergent bottle, for the meanwhile. Medicine waste can be packaged in a rigid container. Any printed information about the medicine or prescribed patient, should be erased or covered. Dispose Of It: Bring your home generated medical waste to your local California State approved collection site for free and proper disposal. Remember, all sharps waste must be properly packaged. For medicine waste, check which of the collection sites on the list indicate that they also accept medicines for disposal. The not free free option: If you need a professional company to come collect and dispose of your medical waste, contact MedWaste Management at (866) 254-5105. We collect and dispose of all types of medical waste, from all types of facilities in California, such as healthcare facilities, schools, homes and businesses. Since this disposal option is not free, it is recommended for the disposal of large quantities of home generated medical waste, or anyone who wants to pay for this convenience. What is home-generated medical waste? In Septemebr 2008, it became illegal in California to place your home-generated sharps waste in the regular trash container, or to flush it down the toilet. Sharps Waste – Home-generated sharps waste means hypodermic needles, pen needles, intravenous needles, lancets, and other devices that are used to penetrate the skin for the delivery of medications derived from a household, including a multifamily residence or household. See California’s Medical Waste Management Act section 117671. Medicine Waste – Home-generated medicine waste means expired or unused medicines, whether prescription or over the counter. Alameda County – Find information about how to properly dispose of home generated sharps and medicine waste in Alameda County, CA. Alameda County Medication Drop Off Sites – Find the 41 locations, where Alameda County residents can drop off unwanted prescription and Over-the-Counter drugs and medications, including controlled substances. Alameda County Public Health Dept. – Find information about how to properly dispose of home generated sharps waste in Alameda County, CA. CityofLivermore.net – Find information about how to properly dispose of home generated sharps waste in the city of Livermore, CA. StopWaste.org – Find out where to dispose of of sharps waste and medicine waste in the cities of Fremont, Hayward, Livermore and Oakland, in Alameda County, CA. Butte County – Find information about how to properly dispose of home generated sharps waste in Butte County, CA. CityofOroville.org – Learn how to dispose of home generated sharps waste and pharmaceutical waste in the city of Oroville, CA. Countyof Colusa.org – Learn and see a video about how to dispose of home generated sharps waste and pharmaceutical waste in Orange County, CA. ContraCostacountyhealth.org – Learn more about how to dispose of home generated sharps waste and pharmaceutical waste in Orange County, CA. DeltaDiablo.org – Learn how to dispose of home generated sharps waste in Delta Diablo District, in East Contra Costa County, CA. PleasantHill.ca.us – Learn how to dispose of home generated sharps waste in the city of Pleasant Hill, CA. ElDoradoCountygov.us – Learn more about how to dispose of home generated sharps waste and pharmaceutical waste in El Dorado County, CA. KernCountywaste.com – Learn about how to dispose of home generated sharps waste in Kern County, CA. Azusa.ca.us – Learn how to dispose of home generated sharps waste and pharmaceutical waste in the city of Azusa, CA. AgouraHills.ca.us – Learn how to dispose of home generated sharps waste and pharmaceutical waste in the city of Agoura Hills, CA. Calrecycle.ca.gov – Find locations throughout California that will accept a variety of special wastes. Calrecycle.ca.gov – Learn how to dispose of home generated sharps waste and pharmaceutical waste in California. CityofBell.org – Learn how to dispose of home generated sharps waste and pharmaceutical waste in the city of Bell, CA. Lakewoodcity.org – Learn how to dispose of home generated sharps waste and pharmaceutical waste in the city of Lakewood, CA. dpwLAcounty.gov – Learn how to dispose of home generated sharps waste and pharmaceutical waste in Los Angeles County, CA. MontereyPark.ca.gov – Learn how to dispose of home generated sharps waste and pharmaceutical waste in the city of Monterey Park, CA. MarinCounty.org – Learn more about how to dispose of home generated sharps waste and pharmaceutical waste in Marin County, CA. CountyofNapa.org – Learn about how to dispose of home generated sharps waste in Napa County, CA. KeepTruckeeGreena.org – Learn how to dispose of home generated sharps waste and pharmaceutical waste in the city of Truckee, CA. FountainValley.org – Learn how to dispose of home generated sharps waste and medicine waste in the city of Fountain Valley, CA. LaHabracity.org – Learn about how to dispose of home generated sharps waste in the city of La Habra, CA. Orangecounty.com – Learn how to dispose of home generated sharps waste and pharmaceutical waste in Orange County, CA. Orangecountyhealth.com – Learn more about how to dispose of home generated sharps waste and pharmaceutical waste in Orange County, CA. RanchoSantaMargarita.org – Learn about how to dispose of home generated sharps waste in the city of Rancho Santa Margarita, CA. SanJuanCapistrano.org – Learn about how to dispose of home generated sharps waste in the city of San Juan Capistrano, CA. RecyclinginLincoln.com – Learn how to dispose of home generated sharps waste and pharmaceutical waste in the city of Lincoln, CA. CountyofPlumas – Learn how to dispose of home generated sharps waste waste in Plumas County, CA. Coronaca.gov – Learn how to dispose of home generated sharps waste in the city of Corona, CA. Riversidecounty.org – Find information about how to properly dispose of home generated sharps waste in Riverside County, CA. CityofCommerce.ca.us – Learn how to dispose of home generated sharps waste and pharmaceutical waste in the city of Commerce, CA. Temeculaca.gov – Learn how to dispose of home generated sharps waste and pharmaceutical waste in the city of Temecula, CA. CityofSacramento.org – Learn how to dispose of home generated hazardous waste and pharmaceutical waste in the city of Sacramento, CA. Adelentoca.gov – Learn how to dispose of home generated sharps waste in the city of Adelento, CA. AppleValley.org – Learn how to dispose of home generated sharps waste and pharmaceutical waste in the town of Apple Valley, CA. CityofChino.org – Learn how to dispose of home generated sharps waste in the city of Chino, CA. Fontana.org – Learn how to dispose of home generated sharps waste in the city of Fontana, CA. SanBernardinoCounty.gov – Learn how to dispose of home generated sharps waste and medication waste in Los Angeles County, CA. Victorville.gov – Learn how to dispose of home generated sharps waste and pharmaceutical waste in the city of Los Angeles County, CA. Oceanside.ca.us – Learn how to dispose of home generated sharps waste in the city of Oceanside, CA. Poway.org – Learn how to dispose of home generated sharps waste and medication waste in the city of Poway, CA. CityofSanteeca.gov – Learn how to dispose of home generated sharps waste in the city of Santee, CA. Stocktongov.com – Learn how to dispose of home generated sharps waste and medicine waste in the city of Stockton, CA. SanLuisObispoCountyiwma.com – Learn how to dispose of home generated sharps waste in San Luis Obispo County, CA. MountainView.gov – Learn how to dispose of home generated sharps waste and medicine waste in the city of Mountain View, CA. SanDiegocounty.gov – Learn how to dispose of home generated hazardous waste and pharmaceutical waste in San Diego County, CA. SanMateoCountyhealth.org – Learn how to dispose of home generated sharps waste in San Mateo County, CA. CountyofSantaBarbara.org – Learn how to dispose of home generated sharps waste in Santa Barbara County, CA. SantaClara.org – Learn how to dispose of home generated sharps waste and medicine waste in Santa Clara County, CA. SantaClaraFireDept.org – Learn more about how to dispose of home generated sharps waste and medicine waste in Santa Clara County, CA. RecycleNow.org – Learn how to dispose of home generated sharps waste in Sonoma County, CA. Stanislauscounty.com – Learn how to dispose of home generated sharps waste and pharmaceutical waste in Stanislaus County, CA. YubaSutterRecycles.com – Learn how to dispose of home generated sharps waste and pharmaceutical waste in Sutter County, CA. Visalia.city – Learn how to dispose of home generated sharps waste in the city of Visalia, CA. Simivalley.org – Learn how to dispose of home generated sharps waste and pharmaceutical waste in the city of Simi Valley, CA. VenturaCountyrma.org – Learn how to dispose of home generated sharps waste in Ventura County, CA. VenturaCountypublicworks.org – Learn how to dispose of home generated pharmaceutical waste in Ventura County, CA. CityofDavis.org – Learn how to dispose of home generated sharps waste and pharmaceutical waste in the city of Davis, CA. Yolocounty.org – Learn how to dispose of home generated sharps waste in Sonoma County, CA. YubaSutterRecycles.com – Learn how to dispose of home generated sharps waste and pharmaceutical in Yuba County, CA. How can I accept home-generated medical waste at my health care facility or business? If you have a medical facility or business that generated medical waste, and you already properly dispose of your medical waste, you can easily start accepting home-generated medical waste from your patients and community. The sharps must be contained in an approved sharps container. The generator of the home-generated sharps waste, or a member of his or her family, must bring the sharps waste to your facility. The sharps waste is accepted at a central location at your facility. You must properly dispose of the home-generated medical waste that you accept, just as your properly dispose of your facility’s medical waste. included in your facility’s medical waste management plan. See California’s Medical Waste Management Act Section 118147. FLU SEASON! Tips from your medical waste disposal expert. Some chiropractors look at people and “see” invisible lines going through their spines. Speech therapists hear little divergences in people’s accents. Barbers notice hairstyles. Teachers notice things that need fixing. I notice places with contamination potential. Medical waste disposal is all about identifying which medical items can potentially spread pathogens, containing them, and destroying them. I’ve started, however, to notice contamination potential in everyday items as well. Doorknobs, for example. Computer keyboards. Cars with the windows shut and a passenger who’s a carrier…. Don’t ask. So, here are some tips about handwashing, which has been proven effective at minimizing your potential of getting or giving out germs. I know you’ve heard this before. Keep in mind that if you are just not going to get into the habit of washing your hands regularly, it’s important to wash your hands after using the bathroom, after coughing or sneezing, before and after handling food, after coming into contact with an animal, and probably after coming into contact with something that a LOT of other people come into contact with on a regular basis… like doorknobs. 2. Wash your Hands with Soap. You need a minimum of 15 to 30 seconds scrubbing time with antibacterial soap to really remove bacteria from your hands. Don’t forget to scrub between your fingers and the area at the base of your palms. Bacteria gets there, too. Once the soap loosened all the bacteria, you need to make sure none of it sticks right back to your skin. The easiest way to transfer bacteria is with wet hands. So dry your hands. 4. Dry your Hands on a Paper Towel. Air-drying devices can actually increase bacteria count, and also blow germs around in a three to six feet perimeter from the device. Paper towels remove the germs and then they get thrown out into the garbage can. This gives them less potential to infect somebody else with the germs on them. Also, you might consider carrying wipes around with you and using them on doorknobs and shopping cart handles, and the like…. places that many people have put their germs on. 6. If you or anyone in your household is ill, use a crude medical waste disposal bio-hazardous waste precaution and double-bag tissues in a separate garbage can. YOu can get a small container and keep it in the bedroom. In my experience, when someone has a bad cold or flu, the tissues tend to really accumulate. This is your medical waste disposal expert, wishing you good health and happiness, much joy,success, peace and the absence of any sort of flu neurosis this season. The dangers of reusing single use needles.